For many people of all ages, hot summertime temps create an undeniable urge to jump in a pool of water to cool off. However, for senior caregivers, helping their older loved ones cool off in the summer can come with some safety concerns. 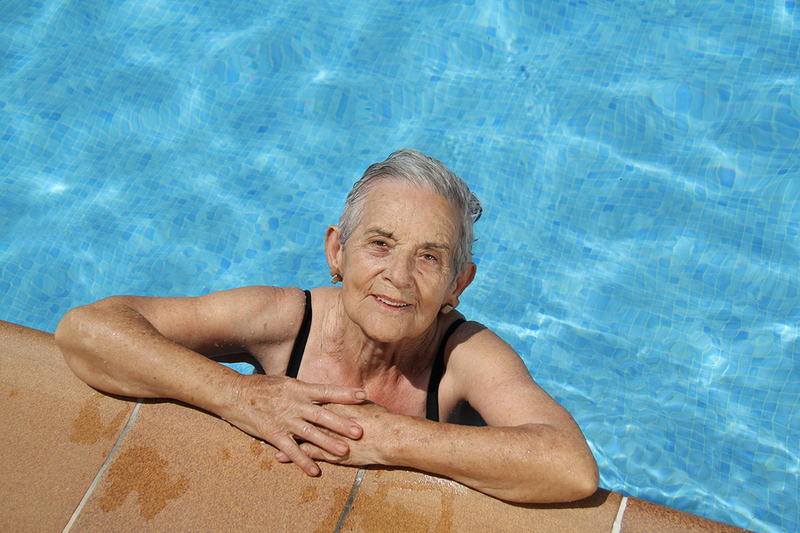 For many seniors, swimming is one of the best summer activities out there. It not only helps them stay cool in comfortable as the heat rises, but swimming is a great exercise for seniors that doesn’t place extra pressure on the joints. Swimming is not only a wonderful way for seniors to get exercise, improve muscle tone and stay healthy, but it can be a fun activity for seniors to do with their grandchildren, and the whole family. If you are helping a loved one jump in for a dip this summer, here are a few tips to keep in mind to make sure they are staying safe while having a great time in the pool. Seniors should always get their doctor’s approval before swimming. While swimming is generally very easy on the body, it is still a rigorous form of cardiovascular exercise. Always start slow, seniors should begin by walking and wading in the pool before jumping in to swimming laps. Seniors always need to swim with a buddy in case something happens. Just because swimming cools the body off, it doesn’t mean you are dehydrated. Any senior who is planning on swimming needs to take water breaks so they can hydrate. Swimming is still a dehydrating exercise. Limit swim sessions to no more than 30 minutes particularly at first, this can be a lot of exercise for any senior and shouldn’t be taken lightly. If seniors aren’t great at swimming or haven’t been swimming in a while, consider using aides or flotation devices when they first get started. Be on the lookout for signs of exhaustion, sudden fatigue, dizziness, falls or feeling weak can all be serious side effects of swimming too much or too hard. If there is no lifeguard on duty, make sure to have convenient access to life-saving devices. Make certain someone in the area knows CPR before allowing a senior to swim on their own. Several studies have found that swimming can help boost brain function in seniors, all while reducing stress, toning muscles and reducing the risk of osteoporosis. In fact, swimming is so good for the body that many seniors who swim regularly are able to build up muscle control and a strong core control so much that they have a significantly lower chance of suffering from a fall. With so many great benefits, it is easy to see why swimming is such a popular activity for many older adults today. Just remember to keep these important safety tips in mind when helping seniors swim this summer so you can make sure they are enjoying their time in the pool in a safe way so that they can keep swimming all summer long.